I’m slowly becoming a bit of a gardener these days. Prior to my life here in Klamath Falls I lived in the big city on a condo with no yard. These days we own a home on a good chunk of land with plenty of room to raise chickens, garden, and generally spend tons of time outdoors without ever leaving the property. As such I’ve been working in the yard quite a bit and have started formulating grand plans for a master garden here on the homestead. I get my coffee jolt in the morning and then get to work outdoors as much as I can. Luckily I’ve found that the spent coffee grounds I use for my morning cup can very easily be put to use in the yard. I know this website isn’t really about gardening – it’s about coffee – but for those of you who want to make productive use out of everything you can I hope you can also find value in this. Don’t just chuck your coffee grounds down the drain or the trash. Put them to good use. In the coming weeks I’ll be posting a few dedicated articles on using used coffee grind in the garden (or yard). I hope you find them helpful if not simply interesting. In the mean time I’ll summarize a lot of the uses for spent coffee in the garden right here and reserve the rest of this page as a main hub for the series with links to the dedicated posts here as they go live. Every time you brew coffee, discarded coffee grounds end up in the trash. I feel it’s such a waste. But, at that time, I really don’t know where else to use it. I did some research and found that instead of just throwing away your used coffee grounds, you can recycle it by using it in your garden. 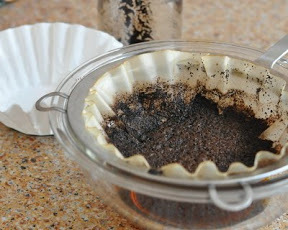 Here are some ideas you can try to maximize used coffee grounds. Coffee grounds have several good effects on the soil. It adds nitrogen, an essential element that nurtures the soil and support plant growth. I adds organic material to the soil, which improves drainage, water retention and aeration in the soil. Because it’s organic, coffee grounds attract microorganisms that are beneficial to plant growth, as well as, earthworms. Used coffee grounds are effective plant pest repellents. Ants, snails and slugs destroy the natural ecosystem. Not to mention they feed on your plants. If you want to keep these pests at bay, sprinkle used coffee grounds on the soil around your plants. In some cases, dried orange peels are mixed with coffee ground to ward off even small mammals like cats and dogs. The strong aroma of the coffee and orange does not sit well with the sensitive senses of cats and dogs. You will not have to worry about animals leaving their business on your flower garden. Used coffee grounds are have neutral pH, compared to fresh coffee grounds. After brewing, the acids and oils are extracted from the coffee beans. As such, used grounds have little acid or almost neutral. When mixed with soil, it adds balance to the natural pH level of the soil. Mix your old grounds with dead grass clippings, brown leaves, or dry straw to neutralize some of the acidity, the spread them around your plants. Used coffee grounds add nitrogen and potassium to the soil, as well as magnesium that promotes plant growth. However, this still lacks phosphorus and calcium that help plants bloom and trees to bear fruit. You can add lime or wood ash to complete the natural fertilizer formula. If you have no immediate plans to use your coffee ground for gardening, you can add it to your compost pit. Used coffee grounds have a lot of “green” matter that is beneficial in promoting a healthy soil. It adds nitrogen to the soil, too. Composting coffee grounds is as easy as throwing the used coffee grounds onto your compost pile. Used coffee filters can be composted as well. Can You Also Use Fresh Coffee Grounds for Gardening? It is not always recommended to use fresh ground coffee, since the essence here is to recycle used coffee grounds. However, one can also use fresh ground coffee for gardening. But there are limitations. Not all plants will benefit from the acidic nature of fresh coffee ground. Sprinkle fresh coffee grounds around acid-loving plants like azaleas, hydrangeas, blueberries, and lilies. Root crops, like radishes and carrots, on the other hand, respond favorably – especially when mixed with the soil at planting time. Tomato plants have adverse reactions to fresh coffee grounds due to its acidity. Fresh coffee grounds can help weeds and fungal pathogens in the soil. Some suggest to use decaffeinated fresh ground coffee. Backyard Boss shared pro tips to maximize the full potential of using coffee grounds for gardening. PRO Tip #1: Go to your local coffee shops and inquire if you can gather their used coffee grounds. You are helping them reduce their waste products and the same time, you get just enough used grounds for your gardening needs. Just turn up with a clean bucket. PRO Tip #2: Mix coffee grounds and eggshells to achieve a richer fertilizer formula. Egg shells are rich in calcium. PRO Tip #3: Germination of seeds of sugar beets, cabbage and soya bean benefit well from the high nitrogen content of soil with coffee grounds. PRO Tip #4: Coffee grounds are anti-microbial and anti-fungal. As the organic material rots in your garden soil, they can stop fungal disease including Fusarium, Pythium, and Sclerotinia. Aside from gardening, coffee grounds have so many other effective use around the house. Place used coffee grounds in a jar and put it inside your refrigerator. It can absorb food odor that permeates the inside of your fridge. Let it sit for two weeks before replacing it. The best part? You can still use the coffee grounds for fertilizer! For this fun up-cycling project you will need a small paper coffee cup, a paper towel, about a cup of wax candle ends, a wick, scissors, a small sauce pan for melting the wax, a small glass mixing bowl, and of course some used coffee grounds. The rough and coarse texture of coffee grounds are effective for exfoliating the skin. Add used grounds to a bit of warm water or your favorite all-natural oil like coconut oil. Rub the mixture on your body and gently exfoliate. Wash with warm water. So that’s it. Expect deep dives into all of these outdoor uses for used coffee in the future and have fun out there!